NEWPORT BEACH, CA. 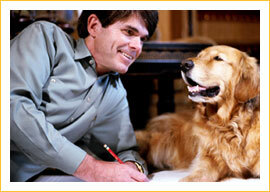 — June 30, 2009 — Trixie, bestselling author Dean Koontz’s beloved golden retriever, was more than a dog– she was an inspiration. And like all good inspirations, they are best when shared. To celebrate Trixie’s life, legacy and magic, a new line of pet products have been created to inspire all that is loved by pets and their owners while doing good for service dogs. The line Good Dog: Trixie Koontz will launch July 1, 2009 in PetSmart stores. Butterfly toys, plush bones, disks and rope tugs to play with dogs. “Dog Bliss You” and “Laugh ’til Your Face Hurts” tanks for a carefree style. Stationery and specialty gifts such as coffee mugs, photo frames, key chains, journals and pens. Author proceeds from Trixie’s many ventures are donated to Canine Companions for Independence where Trixie started her life as a service dog. She retired after an injury to become a furry daughter to Dean & Gerda Koontz. It wasn’t long before Trixie found her voice as a contributor to Dean’s website (www.DeanKoontz.com) with her humorous commentary on life which attracted her own fan following. Soon she became a bestselling author herself with three books. She impacted her human family in the best of ways, changing their lives for the better until the fateful day she suddenly passed on June 30, 2007. Dean shared his loss with his fans and their outpouring of love and sympathy was overwhelming. Trixie also inspired Dean to write his first non-fiction book, A Big Little Life: A Memoir of a Joyful Dog. Releasing August 25, 2009, Dean tells his own story of unexpectedly falling in love for the first time in middle age. The story is filled with humor, joy, and lessons learned– including living with loss. This powerful tribute ultimately reminds us that love of our canine best friends lasts beyond a lifetime. Trixie is now the star of a children’s book series written by Dean. The first book, I, Trixie, Who is Dog, from Penguin books is coming this fall. Fans of all ages will be delighted to learn more about Trixie and meet her avatar at www.deankoontz.com/trixie/. Trixie’s Bliss to You “blissings” will be published by Hyperion in a calendar for 2010, launching this August. Dean Koontz is the critically acclaimed bestselling author of more than seventy novels, many of which have achieved the top spot on the New York Times bestseller list selling over 400 million books in 38 countries worldwide. (www.deankoontz.com) Broadthink directs online marketing for Dean Koontz and has spearheaded Good Dog Trixie brand development including the retail exclusive Trixie pet products program, Trixie licensing, and Trixie’s children’s publishing. Broadthink, is a boutique branding and new business development company. Since its inception in 2002 Broadthink (www.broad-think.com) has worked with a variety of clients from Fortune 500 companies to individual owners of unique intellectual property rights.